The Industrial Revolution, which took place in the last part of the 18th century and into the 19th century, was actually a vast change in the way the world worked, due to such advancements as the steam engine, the spinning Jenny, the cotton gin, railroads, and the telegraph. The upheaval began in Great Britain, and then spread to Germany, the United States, and France before becoming a nearly worldwide revolution. Although it took more than 100 years, the events which make up the industrial revolution are still astounding. In the 18th century, manufactured products were made from home businesses, but the Industrial Revolution brought industry into factories where things were mass-produced. Aside from making the differences in manufacturing itself, the Revolution also changed transportation and communication as one invention or idea played off another. In the late 1700s, Samuel Slater, frequently called "the father of the Industrial Revolution," came to the United States from England. He became an apprentice to the partner of one of the first cotton mills in his homeland at the age of 14. After eight years, he became the superintendent of the mill, and within a few years, he knew not just how to operate the machines, but to build them as well. He became convinced that the textile industry in England had peaked, and in 1789, he immigrated to the United States in order to make a fortune helping to grow the still-new textile industry there. He had sent "feelers" out to existing mills, and one of those companies, Almy & Brown of Pawtucket, Rhode Island, took him up on his offer. That mill made and sold cloth which was manufactured using spinning wheels, jennies, and frames which were powered by water, was not working for them. Slater signed a contract with Almy & Brown, promised that if he was unsuccessful, he would not accept payment, and set about replicating the machinery which he learned to build and use in Britain. A couple of years later, he had finished building the first successful water-powered mill in the Colonies. He then set about hiring entire families, including children, to work in the company's mills, generally allowing those families to live in company-owned housing, send the children to company-run schools, shop in company-owned stores, and even attend company-owned churches. This system, which became known as the Rhode Island System, was attractive to many farmers, who left agriculture in order to work in the mills, fueling the American Industrial Revolution. In 1798, he left Almy & Brown, by now known as Almy, Brown & Slater, and founded a company with his father-in-law which established mills throughout Rhode Island, Connecticut, New Hampshire, and Massachusetts. Eli Whitney's cotton gin had been patented in 1794, allowing for the mills to prosper beyond all expectations as well as swinging the door wide open to the American contributions to the Industrial Revolution. His invention was called the "gin," which he meant to be short for the word "engine." It used a wooden drum which had a series of hooks which mechanically removed seeds from cotton, a task that had been exceedingly labor intensive up until then. He said that he was inspired to create the gin after watching his cat pull a chicken through a fence and being able to get nothing more than feathers through that fence. The fact that his cotton gin could produce 55 pounds of clean cotton a day was instrumental in the economic development of the American South. As a consequence, it quite likely extended the existence of slavery in North America by adding to the sustainability of the practice. Although Whitney got his patent in 1794, it was not validated until late 1807, and he struggled for years with patent infringement, as others copied his invention to fill the avid demand for it, and Eli eventually made his living manufacturing muskets for the newly-formed American military. Innovations like Elias Howe's sewing machine and its affect on the textile and clothing industries served to further the early 19th century part of the Industrial Revolution. Walter Hunt had built the first functional sewing machine in the United States in 1830, though it could only sew straight seams. His belief that it would cause massive unemployment kept him from filing a patent. That was a lucky thing for Elias Howe, who in 1846 improved upon Hunt's unpatented machine by utilizing a needle with the eye at the bottom, pointed part rather than at the top. The needle was mechanically pushed through the cloth, a loop was created on the other side, and a shuttle then slipped the second thread through the loop to create a lockstitch. As was the case in those days, another patent fight ensued, with several other inventors using his "process that used thread from two different sources," as Elias's patent stated. One of those people was Isaac Singer, whose name came to be synonymous with the sewing machine. Robert Fulton was by no means the first person to have the idea of using steamboats, but he was the first to put the design into practical use. When he was 17, he moved from Lancaster County, Pennsylvania to Philadelphia in order to become a painter. At the age of 21, he relocated to London, where he began focusing on practical arts, and then to Paris, where he designed and built the experimental Nautilus Submarine in 1801 before he returned to America and established a steamboat service on the Hudson River, changing the way industry shipped goods and cutting down shipping time significantly. Like Robert Fulton before him, Samuel Morse was a professional painter whose work hangs in the Louvre. Morse was well known as a portrait painter when he invented and perfected a single-wire telegraph system based on the telegraph system and co-invented Morse Code. In 1825, he was in Washington D.C. where he had been commissioned to paint a portrait of the Marquis de Lafayette. While he was working, he received a letter from his father by horse messenger telling him that his wife, Lucretia, was gravely ill. The very next day, he got another letter telling him that his wife had died. Before he could get home to New Haven, Connecticut, she had been buried. He was devastated that he had been ignorant of his wife's state of health and the fact that she died without having him there, or even knowing about it. It was at that point that he began to seek a method of practical long distance communication. He received the patent for his telegraph, the building block of our modern communication, in 1847. That invention has four parts to it: the battery supplies electricity; the electromagnet acts as a receiver, the telegraph key sends the signals, and the wire connects the receiver and the key. When the telegraph operator presses the key, it completes the circuit, sending the current through a small electromagnet which consists of a coil of wire wrapped around an iron core. That produces the electromagnetic force which emits a click. When the key is released, the current stops, sending the sounder up with another click. These are, of course, only a few of the people and innovations which made up the Industrial Revolution, but important ones. Gives a detailed background of the Industrial Revolution, including the economic and scientific factors of the time. Also profiles what the author believes are the top ten significant inventors of the era and details about the cotton gin and steam engine. Delves into the industrial revolution with items about Britain's industrial advantages in the 18th century, the flying shuttle, the steam engine, and gun barrels, among many other factors. Highlights the changes which caused the revolution as well as advent of the factory, both in Europe and America. Also goes into the problems with capital and labor which resulted. Exhibits information about the industrial revolution, including agricultural changes, changes to the textile industry, coal mining, steam, and transportation. Also offers a bibliography for teachers as well as one for students. 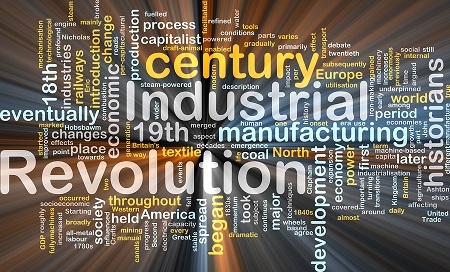 Search for Industrial Revolution on Google, Bing, or Yahoo!